It’s a beautiful day in Arkansas and it’s a balmy 77 degrees according to my outside thermometer. With temperatures like this, I like to go into my garden and start planting and getting everything ready for Spring. However, not so fast, by Friday the weather will remind us that winter is still in full force with freezing temperatures and maybe even some snow. YIKES!! So, after spending some time outside and soaking in this beautiful weather I came up with this card using the Beauty Abounds stamp set from the Stampin’Up Occasions catalog. This set comes with 13 cling stamps and 20 dies. The bundle retails for $55.75 which qualifies for a FREE item form the Sale-A-Bration catalog. I just want to remind everyone that the Sale-A-Bration catalog freebies will not be available after March 31. DON’T MISS OUT! 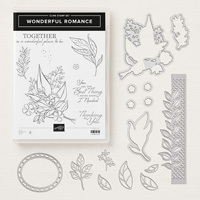 Also, on February 15th, Stampin’Up has added more freebies to the catalog. Click on the Second Release Sale-A-Bration icon and get a sneak peak on what’s to come. The new items are free with any $50 or $100 purchase (after shipping and tax). 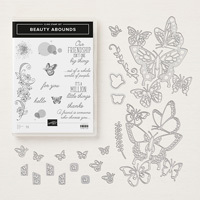 I used the bubble stamp from the Beauty Abounds set to create my designer paper. The circle is from the Wonderful Romance set. Shopping with me has it’s own benefits as well. Email me and see what kind of goodies I have to offer. Click on the link below to shop my online store.